1779, the third year of his captivity, slowly came to an end. The quality of his food improved and with his meals he was now given a full instead of a half jug of wine. He was occasionally taken to Rieger's quarters and allowed to play for him. Rieger told Helene at the beginning of December that his mental and physical health had never been better and that he was also receiving many letters from all over, which Rieger would dutifully read to him. He still could not reply to them directly, however. Schubart was now allowed to speak to people, but each time only with prior permission. He was still not allowed to write: at the end of 1779 he had found a pencil and had written some poems. He was caught in the act by Rieger, who confiscated the pencil and the poems. As with previous confiscations, the works were never found again. Of course, for Pietist Rieger, such deception and disobedience was a clear sign of inner corruption, which set back Schubart's rehabilitation. 1780 brought further improvements. By the middle of the year Schubart could receive visitors, but as a cruel twist, not Helene or their children. His imprisonment took on even more of the character of a sadistic play. It was the end of 1780 when the Duke himself told Schubart's son, Ludwig, that he would be able to see his father 'soon'. Ludwig had flourished at the Carl's School in Stuttgart, the school that Schubart had once called 'the slave nursery', even winning prizes. As with most of Carl Eugen's promises, this one was viciously empty. 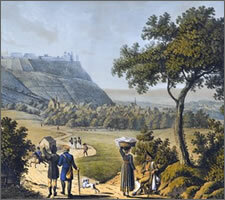 It was another five years before Ludwig could visit his father in Hohenasperg. About this time Schubart also obtained permission walk around the walls of the fortress on his own. Most importantly, he was allowed to write, only, however, under the censorship of Rieger. It appears that it was at this point that the autobiography that he had dictated to Scheidlin was smuggled out: Schubart's Leben und Gesinnungen, 'Schubart's Life and Opinions'. He announced that he had written his autobiography (48 pages) to Helene on 7 January 1781, nearly four years after the start of his incarceration and nearly three years after he had started dictating it to Scheidlin. He said that he would be sending it to her soon, together with some poems. Perhaps among these poems were Die Forelle and Die Fürstengruft. It seems to be out of the question that Rieger read the manuscript. At some point the German censor would have had a word or hundreds to say about it, but Schubart had inserted pages and pages of pious theological muttering by a soul in torment, presumably for the purpose of burying the political dimensions of the work. It is surprising that he never seems to have revised it, completed it with an account of his life after January 1781 or filled in some details. For example, Ludwig adds a note that his father helped to effect Scheidlin's release shortly after his own. [Leben 2:239n] Perhaps Schubart was just sick of thinking about his time at Carl Eugen's pleasure. It would be 1791, the year of his death, before it was finally published. During the course of that year, the pretence of healing Schubart's soul, which had been the justification for the tortures he had undergone in the previous three years, seems to have almost disappeared. Rieger began to use him more and more for his own purposes: to produce poetic conceits that Rieger could send to his friends; to play the piano for Rieger, to write verse, music and plays for the entertainment of the garrison troops, who were bored and restive. For true Pietists, such frivolous entertainments, above all, theatre performances, were the work of the devil. Rieger's willingness to draft Schubart into producing such fripperies reveals just how superficial Rieger's Pietist dogma really had been during the three years he was torturing Schubart with it. What made this artistic slavery worse for Schubart was that when his work pleased Rieger he would be praised extravagantly but at the slightest error or lapse Rieger would go out of his way to criticise him publicly and destructively. The performances that Rieger forced Schubart to put on in Hohenasperg fed Rieger's immense vanity. He had by now also been promoted to major general, which did nothing to reduce his self-esteem. He began to invite selected personages not just from Ludwigsburg but from as far afield as Stuttgart to be in the audience. One particular performance was to create a train of circumstances that would lead to a remarkable meeting, one that would become a part of literary legend. On the occasion of his 58th birthday, 1 October 1780, Rieger commanded Schubart to write him a special piece to be presented in the fortress. At that time, a doctor, Friedrich von Hoven, happened to be visiting his patients in the village of Asperg, which lies at the foot of the fortress. We have already seen Hoven's account of growing up in Ludwigsburg under the tutelage of Special Zilling. The curtain went up and an actor came forward to declaim a prologue written by Schubart in praise of General Rieger. The actor just managed to utter the first line, 'Noble Rieger!' At this the General began clapping and calling 'Da Capo! ', 'Again!' The actor began once more: 'Noble Rieger!' Throughout the performance Rieger burst into applause several times in each scene, not for the actors but for every mention of himself. Out of politeness the rest of the audience clapped on cue, even Hoven, who tells us that he clapped extravagantly, not to praise the General, but to shame the others. Rieger became aware of the stranger's clapping and asked a companion who he was. But as soon as the performance finished Hoven slipped out, wanting, he tells us, to avoid a meeting with Rieger. We cannot let Hoven's specious dissembling on this point pass without comment, it is so characteristic for the Schiller circle. We are supposed to believe that Hoven drew attention to himself with his extravagant clapping 'to shame the others', yet slipped out afterwards to avoid meeting Rieger. The following morning a letter from Rieger was delivered to Hoven, in which Rieger thanked him effusively for his visit to the performance and invited him to visit more often. The doctor, although unwilling to have to undergo a repeat the previous night's experience, had regular business in the village of Asperg and so felt he could not refuse. He presented himself at Hohenasperg some time later. Each visit was followed by a further invitation, with Rieger asking Hoven to bring his friends along, especially Friedrich Schiller, who had just made a name for himself with his play Die Räuber, The Robbers. Hoven's repellant dissembling strikes us once more: he hints at his contempt for Rieger but 'could not refuse' his invitations. The German 'freedom fighters' of the time were really a very special bunch, who did not want to discomfit the tyrants who ruled them. The play had been privately and anonymously published in the late spring of 1781. In July it had received its first review, in which the author of the play was hailed as a possible 'German Shakespeare'. The same journal named Schiller as the playwright on 22 October. Hoven's account is therefore completely consistent with the known timeline for the creation of the play, which received its first performance in Mannheim in January of the following year. The play itself has more than a passing role in the meeting between Hoven, Schiller and Schubart. The plot of The Robbers, in fact, originally came from Schubart, from an anecdote in a short piece he had written in 1775, Concerning the History of the Human Heart. Furthermore, it was Friedrich von Hoven who had recommended the piece to Schiller in the first place. It is a stain on the characters of both Schiller and Hoven that they never credited Schubart with supplying the model for Schiller's extremely successful play. If Hoven hadn't mentioned Schubart in passing in his memoirs written after both Schubart and Schiller were dead we would probably have never known about the source of The Robbers to this day. Unfortunately, Just one more example of Schiller's 'borrowing'. A further twist to this convoluted tale is given by the fact that Rieger was one of Schiller's nine godfathers. Although the relationship was not close, it would have been in both their minds during this encounter. A visit was arranged in November 1781, which Rieger was to turn into one of his cat and mouse games with Schubart. The opportunity for the sadist to humiliate his prisoner was too good to miss. Knowing that Schiller was coming, Rieger gave Schubart a copy of The Robbers and asked him to write a review of it for him, which Schubart did. 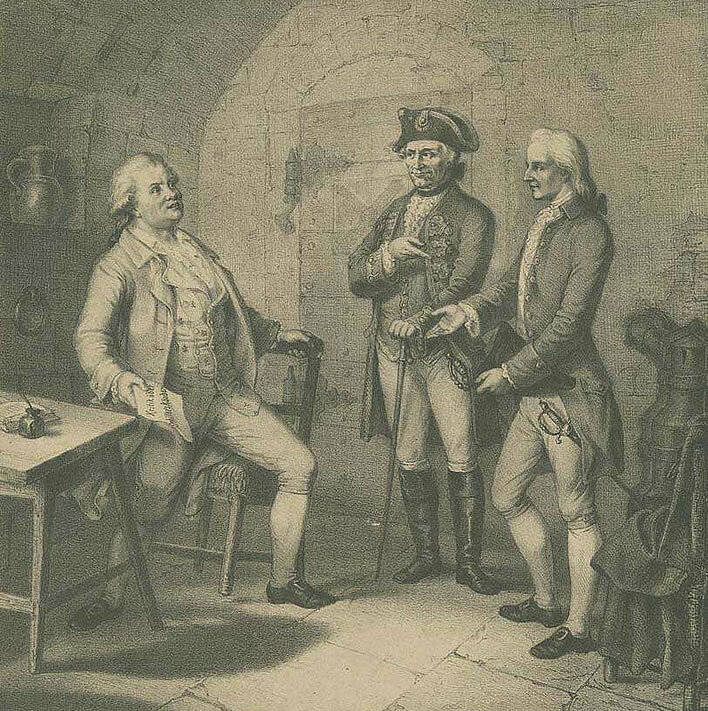 When Schiller and Hoven arrived at the fortress, Rieger greeted Schiller, his godson, with excessive politeness and arranged to introduce him to Schubart, who had never met Schiller face to face, under an assumed name, 'Dr Fischer' (Schiller was training to be a military doctor at the time). When Schubart met Schiller. 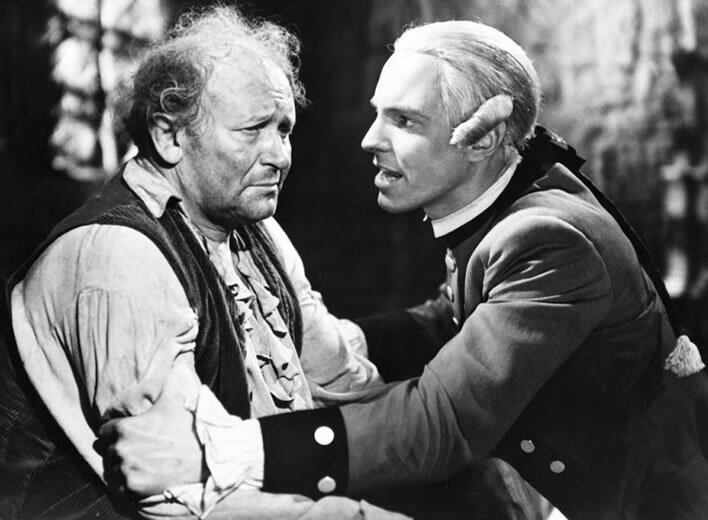 A still from the film Friedrich Schiller – Der Triumph eines Genies from 1940, directed by Herbert Maisch. Here we see the meeting through National Socialist eyes of handsome hero genius Friedrich Schiller (Horst Caspar) with not-quite-so-handsome hero Christian Schubart (Eugen Klöpfer). In the NS version, Duke Carl Eugen sends Schiller to see Schubart in Hohenasperg in order to frighten Schiller out of his rebellious ideas. Rieger arrests Schiller, thinking that the Duke has sent Schiller there for that reason, but Carl Eugen orders his immediate release. [No. I don't understand any of this either]. A lithograph from 1859 by Bonaventura Weiß that follows Schubart's own account of the meeting quite closely. Schubart is seated, holding a paper titled Kritik über Schiller's Räuber 'Critique of Schiller's Robbers'; Rieger is in the middle, pointing to Schiller and enjoying his little joke; Schiller is on the right. Image: Hauptstaatsarchiv Stuttgart. We can perhaps forgive the two young men, just in their early twenties and one of them a godson of Rieger, for their naivety in participating in Rieger's buffoonery and not seeing its sheer malignancy. Your author has great contempt for the character of Schiller, the 'German Rousseau' and for his sidekick Hoven, but will spare you that rant on this occasion. Fortunately for Schubart his review seems to have been positive, probably much to Rieger's disappointment, since Schubart could usually be relied upon to be quick with his opinions and excessive in praise and blame, particularly towards a play that was 'based on' one of his own works. What could thus have been a wounding encounter for both Schubart and Schiller ended harmlessly. Schiller himself said later that his play had weaknesses, perhaps some of these weaknesses had even been mentioned in Schubart's review. At the time of the encounter Schiller was revising his play before its first performance. Schiller made a habit of 'borrowing' the work of others in order to 'improve' it with his cleverness and so in this, Schubart was only one of his victims. We can only wonder at the autocratic disdain with which Rieger treated his 'geniuses', his quiet contempt for them and the ease with which they let themselves be manipulated and humiliated. Schiller, mindful of Schubart's fate, was to flee Württemberg for Mannheim, out of the reach of Carl Eugen, just a few months after The Robbers was first performed.